Just who are these two British child actors/singers/dancers/entertainers? After a quick read through of the back of the DVD box and some YouTube video views, I discovered that Sophia and her cousin Rosie are famous for viral videos and appearances on “The Ellen Show.” This, in turn, led to the two getting their own direct to DVD feature film titled “Sophia Grace and Rosie’s Royal Adventure” which sees the duo acting as Ellen show correspondents for a Queen’s coronation. ‘Royal Adventure’ is clearly trying to emulate the enormously successful made for video Mary Kate and Ashley Olsen movies of the 90’s, but the major difference between the two duos is that Sophia Grace and Rosie never had acting experience on a hit show prior to this movie. As a result, this cutesy LOUD film is extremely uneven and more than a little bit exploitive to say the least. With all of that said, Sophia and Rosie seem to have a loyal fanbase who will undoubtedly want to check this film out. I’m sure children (especially young girls) will get a kick out of this as well. As for everyone else, you would do well to avoid it all costs. Note: The film is presented in widescreen with a Dolby Digital 5.1 audio track. Extras include an activity booklet, a Color Me Mine coupon, Warner Brothers trailers, a sing-along to 5 songs, a montage of appearances on Ellen’s show, 4 minutes of bloopers, and a featurette in which Sophia and Rosie talk about their love of pink. Doctor Who Returns To The Big Screen! After an enormously successful “Doctor Who: The Day of the Doctor” theatrical event in November, 2013, Fathom Events and BBC Worldwide are prepping to screen more “Doctor Who” episodes in theaters across the United States. This time around the event is centered around fan favorite David Tennant (the 10th Doctor). 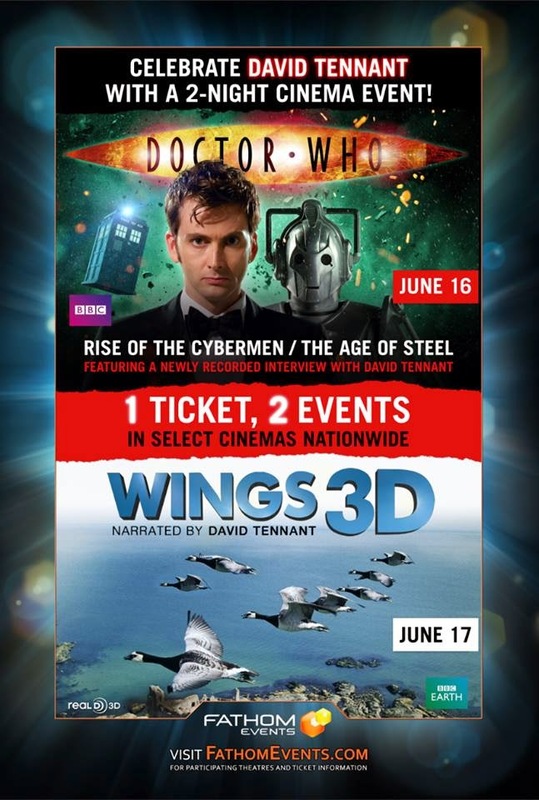 On June 16th, the Cybermen 2 parter “Rise of the Cybermen” and “The Age of Steel” will hit the screens at 7:30 p.m. As an added bonus, fans who purchase tickets to the DW event will also have the opportunity to see the David Tennant narrated bird documentary “Wings 3D” on the following night (June 17th) at 7:30 p.m. for no additional cost. You simply use the same ticket to see BOTH events. Visit http://www.fathomevents.com/event/doctor-who-and-wings/more-info/details for further details and theater listings.